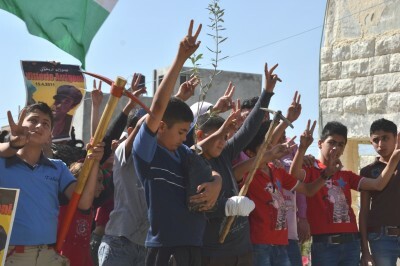 On the 16th of April, the children of the Retaj Centre for Women and Children in Asira planted an olive tree on a piece of land which has been named after Vittorio Arrigoni. This symbolic act was made to remember the Italian volunteer killed on the 15th of April 2011. Asira is located south of Nablus, and is a village that is frequently attacked by settlers from nearby illegal settlements. The children of the Retaj Center for Women and Children took part in an emotive memorial for Vittorio, gathered in the small center, joined by volunteers from ISM and other organisations. 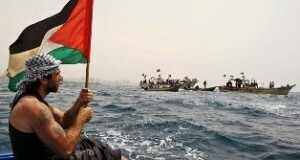 The song “Bella Ciao” is an Italian resistance song that Vittorio taught the children of Gaza before he died, and the children of Asira sang it together. The assembly also watched a short movie entitled, “Un fiore per la liberta” by Samantha Comizzoli. The gathered people marched from the Retaj Centre to an area of land that the owner has named after Vittorio Arragoni, where a young olive tree was planted. The crowd screamed “Stay Human” into the sky, Arrigoni’s best known quote. The people decided that they will plant a new olive tree on this land each year. A quote from Vittorio before he died, including a line from the Italian poet, Enzo Biagi: “Enzo Biagi said ‘Truth is like poetry, it doesn’t need any adjectives, it is freedom.’ We will keep making poetry of our lives until freedom will be declared over the broken chains of all oppressed peoples”. This quote from Vittorio illustrates his willingness and passion to fight for freedom and to defend human rights. During these past days, Palestinians in Gaza have remembered the Italian volunteer. 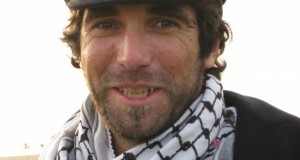 Vittorio loved Gaza, his memory lives on, and should serve as one reminder to continue the struggle for a free Palestine.